ParkCloud is very pleased to announce a new partnership with Aberdeen Airport, offering spaces at 3 car parks with immediate effect. 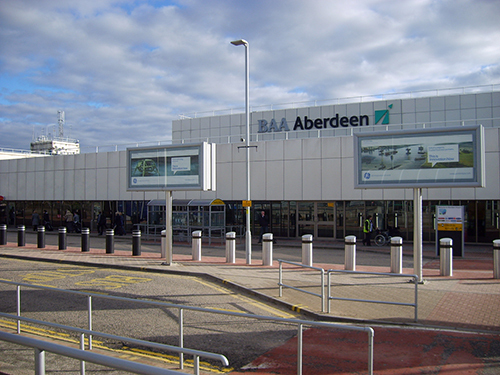 Aberdeen Airport is the third largest in Scotland, and the UK's 14th largest airport – serving over 3.8 million passengers in 2015. With an average 7.8% growth per annum since 2012, recent developments include the on-going £20m extension to the main terminal building, and opening of a new high-quality off-site car park. ParkCloud will be promoting 3 car parks at Aberdeen Airport: Short Stay, Long Stay and Park and Depart. With each earning the Park Mark Safer Parking Award, customers have the option to choose which car park suits their needs the most. The Short Stay car park is located directly opposite the terminal building, so involves just a short walk from the car. With CCTV and security controls, safety of the vehicle is not compromised due to the busy location. The Long Stay car park, located slightly further away, offers a complimentary shuttle bus to the terminal with transfers running every 3 minutes, 24 hours a day. As well as working with airports directly, ParkCloud is also working with airlines including Wizz Air and airBaltic. Using a dedicated site powered by ParkCloud's reservation platform, Aberdeen Airport will be available on both airlines dedicated airport parking sites.